After a dominating performance three-handed on, Justin Pechie has taken out Dale Eberle heads-up and won himself a World Series of Poker bracelet. 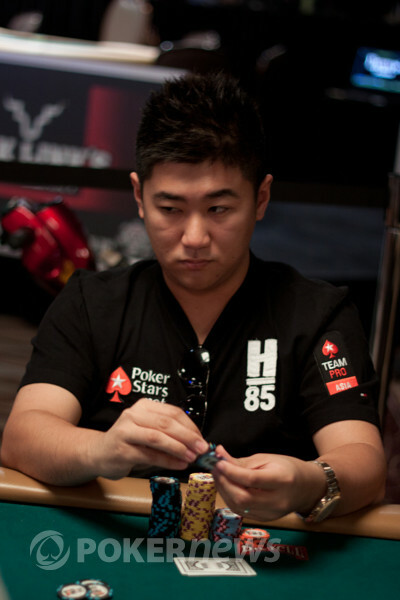 We started this event with 538 players, and then 60 table winners came back on Day 2 to play 10 six-handed tables. The winners of those tables came back today for our final table of 10. Those players were Ari Engel, Chris Kwon, Dom Denotaristefani, Adam Tyburski, Stephen Bass, Jordan Rich, Team PokerStars Pro Eugene Katchalov, Mathieu Jacqmin, and second place finisher Dale Eberle. Eberle came back from being down to 50,000 chips to reach heads-up play, but it was Pechie's game once it got down to business. 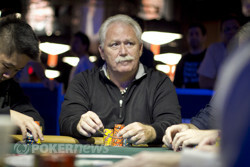 In this following hand, Pechie got up to an eight to one heads-up chip lead and from there his win was secured. Dale Eberle raised it up on the button, Pechie re-raised from the big blind, and Eberle called. The flop came down Pechie bet, and Eberle called. The turn came and again Pechie bet and Eberle called. The river was the and again Pechie bet, this time Eberle raised, Pechie re-raised and Eberle made the call confidently throwing down for a rivered top pair. It was no good though as Pechie showed for the set and the win. Pechie waded through an extremely stacked field on all three days to get here, and after three table wins he is our champion. Once he won and soaked it all in, he was on the verge of tears as he finally got a hold of his first bracelet and we can't blame him. 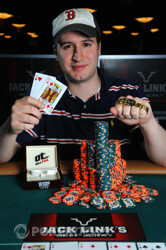 Congratulations Justin, you just won $167,060 and a World Series of Poker gold bracelet!! Justin Pechie had just crippled Dale Eberle on the hand before, when Pechie flopped a set of queens and got value from it on all three streets. 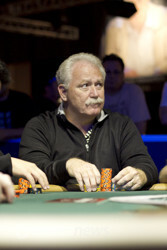 Eberle had under two big bets, and all those chips went in the middle preflop. The flop came , giving Pechie a big lead in the hand. Eberle woud need a ten or running pair cards. The turn brought the , and Eberle needed a non-diamond ten on the river. It came the , and Eberle was eliminated, giving Justin Pechie the win. Justin Pechie has an eight to one chip lead right now on Dale Eberle in heads-up play after this hand. Eberle raised it up on the button, Pechie re-raised from the big blind, and Eberle called. The flop came down Pechie bet, and Eberle called. The turn came and again Pechie bet and Eberle called. The river was the and again Pechie bet, this time Eberle raised and Pechie re-raised and Eberle made the call confidently throwing down for a rivered top pair. It was no good though as Pechie showed for the set and the win. 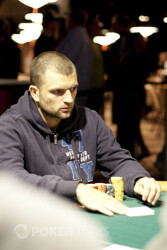 After eliminating Mathieu Jacqmin, Pechie enters heads up play with nearly over a 2-to-1 chip lead over Dale Eberle. 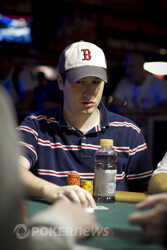 Despite having the chip lead to start three-handed play, Mathieu Jacqmin was never able to get anything going. He was stuck in a freefall that just ended with Justin Pechie getting the last of his chips. Pechie raised in the small blind, and Jacqmin called in the big blind. The flop came out , and Pechie bet out. Jacqmin came back with a raise. Pechie reraised, and Jacqmin opted to call. The hit the turn, and Pechie bet again. Jacqmin just called this time, and the river came the . Pechie bet out a third time, and Jacqmin put the last of his chips in. Pechie called, revealing for two pair. Jacqmin shaked his head, showing for a rivered two pair. Justin Pechie raised it up in the small blind, Mathieu Jacqmin re-raised from the big blind, and Pechie called to see the board. Pechie checked, Jacqmin bet, and Pechie called. The turn came and again, Pechie checked, Jacqmin bet and Pechie called. The river came and both players checked. Despite starting three handed play as the short stack, Justin Pechie has been extremely aggressive, and has taken the chip lead after a few big pots. First Mathieu Jacqmin raised on the button, and both Eberle and Pechie called, creating one of the first family pots of the day. The flop came out , and Jacqmin bet after Eberle and Pechie checked. Eberle called, but Pechie raised. Jacqmin folded, and Eberle called. The turn came the , and Eberle checked to Pechie, who bet. Eberle mixed it up, as he was the one raising this time. Pechie called, and both players checked the river, the . Eberle showed for just ace high, and Pechie showed for a pair of jacks. On the next hand, Pechie put in two bets, and Jacqmin put in a third bet. Pechie called, and the flop came out . Jacqmin bet out, and Pechie called. The turn came the , and again Pechie called. The river brought the , and Jacqmin bet out a third time. Pechie called once again, and Jacqmin showed for just ace high. Pechie showed for top pair, and he took a lead in the three handed battle. Dale Eberle was down to just 50,000 before the dinner break, and now, three-handed, he is up to 1,750,000, thanks to some incredible cards and a lot of betting. On one particular hand, Justin Pechie raised on the button, Mathieu Jacqmin re-raised in the small blind, and Dale Eberle put a fourth bet out there from the big blind. Pechie folded and Jacqmin made the call. The flop came down Jacqmin checked, and as has been his style, Eberle's bet was instantly in the pot. Jacqmin check-raised and Eberle auto-called. The turn was the and Jacqmin again bet with Eberle raising. Jacqmin made the call and the two saw the river . Before the river card even hit the felt, Eberle threw 80,000 in the pot out of turn. Jacqmin seemed annoyed, but called the bet. Eberle showed and won the big pot. The very next hand, Justin Pechie raised it up on the button and Eberle called from the big blind. The flop came down and and Eberle bet out. Pechie raised it, Eberle insta-re-raised it, and Pechie called. The turn was the Eberle bet and Pechie called. The river was the and Eberle again bet with Pechie calling. Eberle showed for the runner-runner straight and he took down the pot. Eberle is running hot right now, and if he continues to get big cards, he won't be stopped on his way to a win.